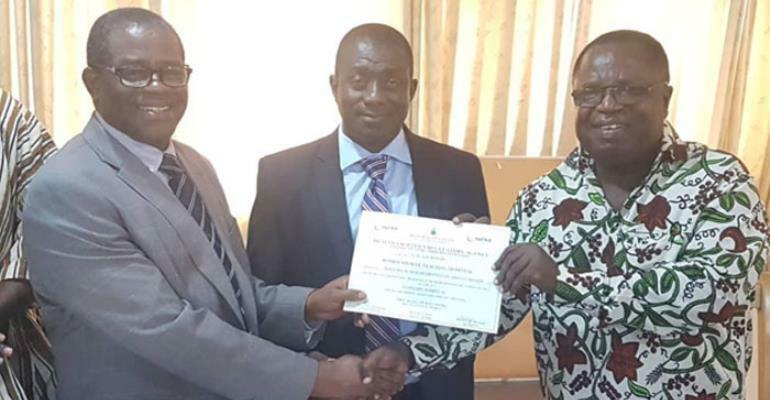 The Health Facilities Regulatory Agency (HeFRA) has presented the Komfo Anokye Teaching Hospital (KATH) with its operational licence after a successful application by the hospital. He said hospitals are to register with HeFRA, so that their facilities would be inspected to see if they meet the standard before they are given a licence. “After getting the license as KATH had done, we shall periodically monitor their activities to see if they are still doing the right thing,” Nana Otuo Acheampong explained. The CEO of KATH, Dr. Oheneba Danso, lauded KATH's staff for their roles, which helped KATH to secure 84.3 per cent during HeFRA’s rigid assessment. Dr. Danso indicated that KATH's main focus is also to expand and improve to international standards, so he called for public support to achieve their target. Meanwhile, about 14,000 medical institutions in the country, including public and private facilities, face close-down as a result of their failure to register and secure operational licence from HeFRA as the law requires. Hospitals are, therefore, by law required to have HeFRA licence to enable them to provide minimum standard of care to the public.